Florida State College at Jacksonville has many events to offer students to get them involved with the school. 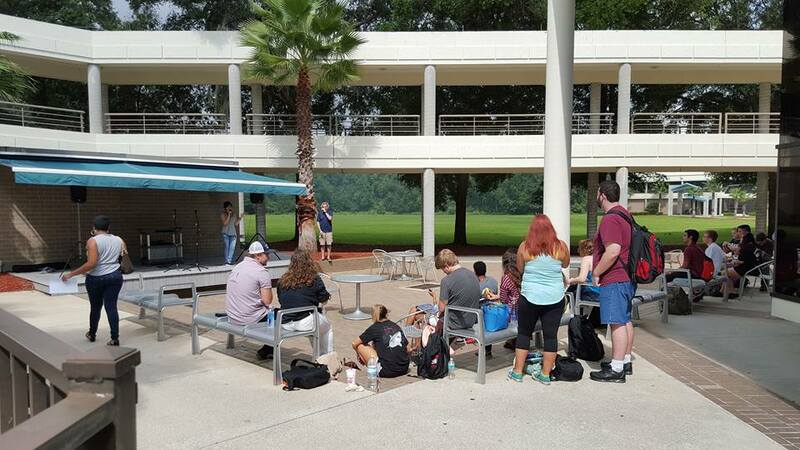 One important event that occurred in the courtyard outside of the cafeteria on October 1 from 11 to 1 was an Open Mic event. The Open Mic events are open to all students, faculty and staff. These events occur on every college campus according to Student Life mentor, Ben Yung. Yung chooses the dates and times for the event on South Campus. Students are free to do whatever they choose, whether it’s singing, rapping, or dancing as long as there is no cursing or vulgar moves. Marco Tacandong, a student at FSCJ, performed at the last Open Mic event dancing to the song OG by Troy Boi. “I thought [the Open Mic] was interesting. It intrigued me. I like things like that,” Tacandong explained. Tacandong encourages students to sign up and perform showcasing their talents. To perform, the students sign up on a sheet writing their name and what they will be doing. The students have no time limit to their performance. They also sign a social media waiver just in case they were to be videotaped and put on the FSCJ website or on another website. Whatever the students want to do, the use of a soundboard to play music helps them perform. Students can also plug in their phones if they want to play their own music or something they may have written. Either way the students at FSCJ are encouraged to share their talents and those that have the courage to get on stage are celebrated. In order for students to hear about the events Student Life posts information on social media and advertisements and flyers on the bulletin boards on campus. However, the students most commonly hear about the event through word of mouth. These events bring the community of students, faculty and staff together. Finding out about events planned for everyone on campus is an exciting moment. Having something that pulls the entire college campus together, especially something as entertaining as an Open Mic is a fantastic idea. Students are encouraged to attend the next Open Mic event and see if they’ll enjoy it. The Open Mic is definitely something no one wants to miss. Check out the Student Life calenders for more upcoming Open Mic events on your campus. Also a special thank you to Benjamin Yung from South Campus Student Life for the additional images.